Tiana Marie’s John Ruskin inspired art course – a superb video intro! An example of a Goldwork project completed! Film in french this Friday in Keswick! People have now started receiving their new printed brochures. 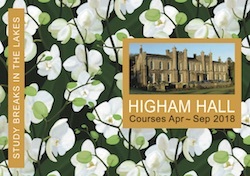 Over 190 new Higham courses up till the end of September are now all visible on our website. The new brochure is viewable in all its glory and you can download your very own pdf copy, by visiting www.highamhall.com/brochure. We hope you find something to enjoy! Tutor Mark Bassey has a song written about him! Nowt much can be done to change what has been done carelessly in the past, but the experiences, once realised, can inform the future. For those of you who understand our careful approach to maintenance and repair here, this is perhaps a reassurance that we are doing the right thing. Here’s one example of why. I’ve got responsibility for kiln firing some pieces created by students on a course. After six weeks’ drying, their ceramic relief plaques will need to be placed inside our kiln and the programme set to heat them up at 25ºC/hr for a over day, eventually reaching over 1000ºC until soaking for five hours and cooling.